Good health being the prime concern, we bring forth hygienic collection of Yashiketin that is an analgesic and antipyretic medicine. This is effective in nature and brings down the high fever into normal. They are used as pain relievers without causing anesthesia. We offer them in different doses and get readily dissolved in blood stream. Each injection constitutes 30 mg per mL of Ketorolac Tromethamine that is a member of pyrrolo-pyrrole group of nonsteroidal anti-inflammatory drugs (NSAIDs). Each ml contains: ketorolac tromethamine USP 30 mg, excipients q. s.
Analgesic and antipyretic. Ketorolac Tromethamine is a member of the pyrrolo-pyrrole group of non-steroidal anti-inflammatory drugs (NSAIDs). Yashiketin injection is indicated for the short-term ( ≤ 5 days) management of moderately severe acute pain that requires analgesia at the opioid level, usually in a postoperative setting. Ketorolac tromethamine is not indicated for use in pediatric patients and it is NOT indicated for minor or chronic painful conditions. Increasing the dose of ketorolac tromethamine beyond the label recommendations will not provide better efficacy but will increase the risk of developing serious adverse events. Multiple-dose treatment (IV / IM) in adults patients < 65 years of age: The recommended dose is 30 mg ketorolac tromethamine injection every 6 hours. The maximum daily dose should not exceed 120 mg.
Single-dose treatments (IV / IM) in adults patients ≥ 65 years of age or renally impaired and/or less than 50 kg (110 lbs) of body weight: One dose of 15 to 30 mg.
Ketorolac tromethamine is a non-steroidal anti-inflammatory drug (NSAID) that exhibits analgesic activity in animal models. Ketorolac tromethamine inhibits synthesis of prostaglandins and may be considered a peripherally acting analgesic. The biological activity of ketorolac tromethamine is associated with the S-form. Ketorolac tromethamine possesses no sedative or anxiolytic properties. The peak analgesic effect of ketorolac tromethamine occurs within 2 to 3 hours. 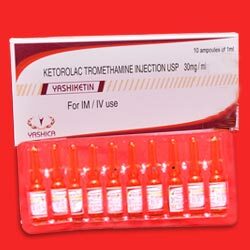 Administration of Ketorolac Tromethamine Injections may cause adverse reactions as G.I. ulceration, bleeding and perforation, nausea, dyspepsia, gastrointestinal pain, diarrhea, constipation, flatulence, gastrointestinal fullness, vomiting, stomatitis, gastritis, rectal bleeding, eructation, anorexia, increased appetite, postoperative bleeding, acute renal failure, liver failure, edema, hypertension, pruritus, rash, purpura, headache, drowsiness, dizziness, sweating, tremors, abnormal dreams, hallucinations, euphoria, extrapyramidal symptoms, vertigo, paresthesia, depression, insomnia, nervousness, excessive thirst, dry mouth, abnormal thinking, inability to concentrate, hyperkinesis, stupor, weight gain, fever, infections, asthenia, palpitation, pallor, syncope, urticaria. Yashiketin Injection should be used with caution in patients with impaired hepatic function or a history of liver disease and hemostasis. The administration of ketorolac tromethamine to patients taking anticoagulants should be done extremely cautiously, and patients should be closely monitored. Ketorolac Tromethamine Injections reduces the diuretic response to furosemide. Concomitant of ketorolac tromethamine and probenecid is contraindicated. Do not mix ketorolac tromethamine and morphine in the same syringe. With previously demonstrated hypersensitivity to ketorolac tromethamine, or allergic manifestations to aspirin or other non-steroidal anti-inflammatory drugs (NSAIDs). As prophylactic analgesic before any major surgery and is contraindicated intra-operatively when hemostasis is critical because of the increased risk of bleeding. Symptoms following acute NSAIDs overdoses are usually limited to lethargy, drowsiness, nausea, vomiting and epigastric pain which are generally reversible with supportive care. Gastrointestinal bleeding can occur. Hypertension, acute renal failure, respiratory depression and coma may occur, but are rare. Anaphylactoid reactions may occur following an overdose with therapeutic ingestion of NSAIDs. Patients should be managed by symptomatic and supportive care following a NSAIDs overdose. There are no specific antidotes. Emesis and/or activated charcoal and/or osmotic cathartic may be indicated in patients seen within 4 hours of ingestion with symptoms or following a large oral overdose (5 to 10 times the usual dose). In controlled overdosage, daily doses of 360 mg of ketorolac tromethamine injection given for five (5) days (three times the highest recommended dose), may cause abdominal pain and peptic ulcers which can heal after discontinuation of dosing. Metabolic acidosis may occur following intentional overdosage. Single overdoses of ketorolac tromethamine may cause abdominal pain, nausea, vomiting, hyperventilation, peptic ulcers and/or erosive gastritis and renal dysfunction which can be resolved after discontinuation of dosing. Dialysis does not significantly clear ketorolac tromethamine from the blood stream.